What do you get when you combine a bomber jacket with a vibrant tropical print and a price tag of Rs. 500? A must have? But of course, a must have. I must admit that as much as I have been lusting over the whole sporty luxe fashion movement, I have not found the ideal mix of sporty with the girly for myself. The right mix where I don't go overboard following a trend blindly and instead adapt it for my personal style. But this bomber jacket in lush tropicals demanded to be taken in just as much as this chequered white midi skirt in net did. It was interesting to see how this odd pairing would work out. Of the tropical bomber jacket and the feminine midi skirt in white net chequered in self. I think it worked, especially with this white satchel bag and the cobalt blue pumps and the almost lack of accessories. Which trend are you flirting with this summer? Love your look! I wore exactly the same sunglasses in my last post. I am obsessed with them! 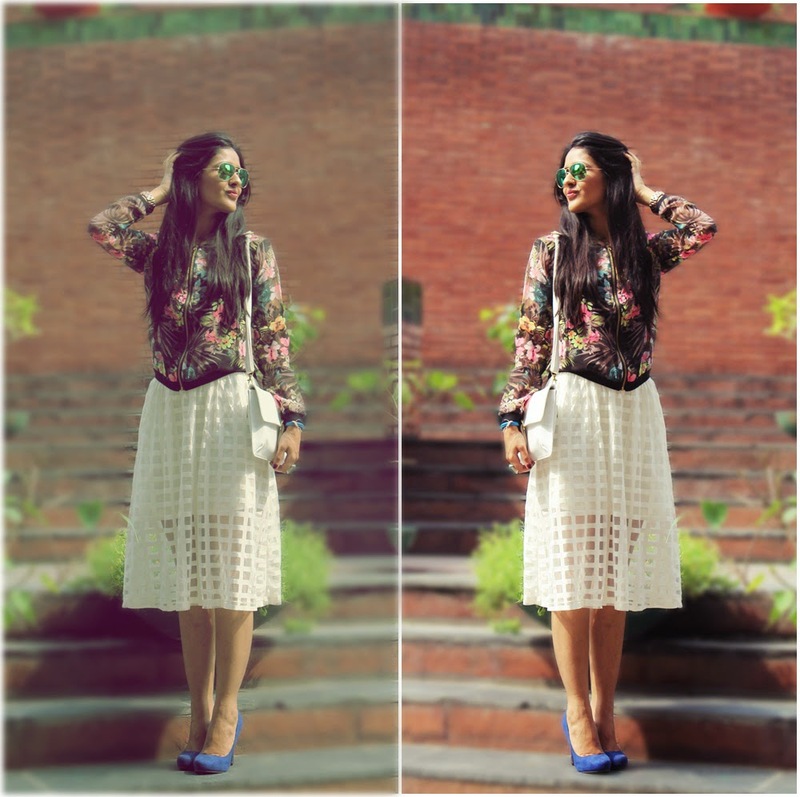 Love the skirt Shreya! This is exactly how I'd like to wear sports luxe too!